Note: please see below for two of my fave dream books, if you’re interested in learning more about what you’re dreaming, and why. These go beyond simple an “A-Z” type dictionary, but they touch on things that will truly help you understand your psyche and do some deep soul searching. I’m very big on dreams. I fortunately (or unfortunately, depending on how you look at it) dream every single night. I’ve had crazy dreams of an Anubis and woke up drained of all energy not able to lift a finger. If you look up their history in Egypt, they would have the ability to drain energy from people. Yeah, needless to say, I don’t sleep very well. I’ve also had dreams of things that have happened the next day, or a few days later. It might sound dramatic, but it was very specific and the details of my dream were recreated. So when I dream, and it sticks in my head, I pay attention. Last night I had a dream with sharks. Sharks, and myself. I was swimming down to the bottom of a (apparently) very shallow ocean, and trying to race my way back up avoiding the shark(s). It was shallow enough for me to be able to hold my breath from the top, to the bottom, and back up to the top. But then again. it was a dream. In a dream, up is down, long is short, nothing is real, and your sanity is tested. I kept feeling like there were multiple sharks, but I only remember seeing one. And I remember seeing its huge mouth with sharp, pointy teeth. I was struggling to get to the surface, but I made it. Without being shark bait. The rest of the dream was blurry, but I decided to look up what exactly a shark means in dream, as it’s something I’ve never seen before. Symbolism 1: Sharks are fearsome creatures of the sea that will tear into every prey. Dreaming of sharks often mean there is an immediate threat close to you. The fear of this powerful enemy or obstacles has you frozen in your tracks. There is little meaning in running away from this fear as foreshadowed by your dream of sharks. The best solution is to confront what is holding you back in order to move on and advance. Symbolism 2: Animals in dreams often stand in for parts of one’s self. As underwater creatures, sharks may represent deep emotions hidden in the unconscious. Since many people associate negatively with sharks, the shark may represent negative emotional states such as frenzied anger or resentment. The shark may be symbolic of the destruction these emotions can bring about if not recognized and dealt with. The shark, especially if it is chasing you, may represent emotions that feel irrational and uncontrollable. 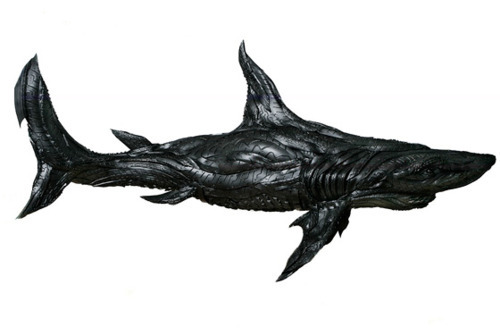 Similarly, the shark may be standing in as a “shadow” symbol – parts of one’s self that one is not acknowledging. Symbolism 3: To see a shark in your dream, indicates feelings of anger, hostility, and fierceness. You are undergoing a long and difficult emotional period and may be an emotional threat to yourself. Perhaps, you are struggling with your individuality and independence. Alternatively, a shark represents a person in your life who is greedy and unscrupulous. This person goes after what he or she wants with no regards to the well-being and sensitivity of others. The shark may also be an aspect of your own personality with these qualities. I have always been fascinated with dreams, most likely because I dream so avidly and often. More importantly, I’ve lately become obsessed with the idea of the dream shadow archetype. The shadow is an area within ourselves that is pushed down- buried amongst the redundancies and noise of the rest of ourselves. The shadow is not necessarily the “evil” inside us -as the name might connotate- but anything inside of us. It can even be the best of us that’s been pushed away. Dreams often bring out a shadow archetype- normally in the form of an animal. I know you’re probably thinking that I’m referring to an animal spirit guide which you can find through meditation, but these are slightly different. These aren’t ones that you meditate to seek, or ones that you see in real life, these are ones that come to you in dreams, disguised as a dream element and not outwardly calling you. What is this dream and shadow trying to tell me? Am I aggressive or predatory? Do I have the characteristics of a shark? Would that even be a bad thing in moderation? I’m trying to sort and make sense of this dream but until it continues, I won’t know what it’s trying to tell me. Hi selena. I agreed with you on the shadow part of dreams. It does have to do with our subconscious thoughts. I also have a good memory of my dreams. We in fact dream everyday but the difference is that most don’t remember after waking up. I have been writing all my dreams down on paper for up to a year and saving it in a shoebox. It is quite interesting all that my mind dreams of or better said what my subconscious brings to light. There is a movie i love based on the dream world called Inception. I love how it reflects on the power of dreams, the capacity of the human mind to create something out of nothing. Our minds are limitless like the universe itself. Or is it our minds that create our perpection of the universe. Inception is a GREAT movie. I’ve been writing my dreams down too, I have some written down from when I was in my teens that I look back to sometimes. Sometimes I think weaving a dream sequence together would make for an awesome movie. I had a beautiful dream about a shark about saving the Sharks life and had a strong and beautiful connection with the shark didn’t feel dangerous it felt beautiful being able to save the shark and put it back into the sea!! I just had a dream like that last night/this morning!!! After I saved it, it let me pet it, then rubbed up against my leg like a cat….I dream every night, and most of the time, I remember my dreams which are always quite vivid and real. This one felt really important, so I’ve been searching all morning. There were also hundreds of dead shark in the water, and I felt so sad, so when I found the one struggling to live, I was so happy I was able to save it. I wish someone could help me with this, because, as I said, it feels very important. I just had a similar dream , 3 sharks got washed up to shore and needed to be saved. We rolled them back in the water. But on shore a family’s dog was passing away of old age and the last shark we could rollin the water. It tried to bite my leg but didn’t because it was sad and needed help. Water appears 90% of the time in my dreams and sharks 50% but I don’t feel scared usually. Kind of like they are just cruising by. Antony!!! It’s Maria from bad. It’s insane to find you on a I dreamt with sharks thread. :D would love to see you. Hi there, last night I had dream of a shark chasing me. I made it to shore but the shark had such velocity it not only reached shore, but broke thru my living room wall. Ive never seen a shark in real life but this one seemed to have a baby bump….? I read you mentioned you almost always remember your dreams? Have you ever or do you have the ability to differentiate between a dream or contusion? When I was little I could do that almost every night. It was the best feeling in the world because you can control everything. Now that im a lot older I can no longer do this regardless of what I’m dreaming. My dreams by thee way, are super vivid. I can feel “physical” pain/pleasure, I can smell, I can taste, and they are always in color. You name it… its good and bad I guess. I’m not able to really “realize” that I’m dreaming and control things anymore, though when I was younger I was often able to do that right before waking up. One thing that used to happen to me a ton, was not being able to decipher whether I was awake or asleep. My dream would begin while I was still partially awake, to the point where my environment around me morphed into the dream so much so, that it looked like I was still awake. Very hard to explain, but there’s one time it happened that still haunts me very vividly. I remember my dreams all the time and they leave lasting impressions that are hard to shake , I also have dreams of things that will happen but often don’t remember until the situation arises and it can freaks me out so I never tell anyone . Last night I dreamed I was at a pool with my brother , there was a large shark in the pool I tried to kill it by dropping a large rock on it but I failed . It swam to the middle bleeding and angry , I told my brother to leave it , as I turned to go I fell in the pool I could feel the shark coming at me , then I woke up . I finally went back to sleep and the next dream was about recovering from the shark attack, it had ripped my heart out. That is how I found your site. I had a dream about a large shark in the water. I was in a boat with two others and I had seen a fin gliding out of the water and I was awed by it. The boat rode along side the shark and I was amazed at how large the shark was….longer than the boat. In my mind I was thinking how huge it was and hoping it wouldn’t jump up at us. We passed by it. Then one of the persons in the boat somehow got into the water and we were concerned that person was going to get eaten, but we got them back in the boat quickly. There were other people on the shoreline watching. I read about what it meant to dream of sharks….all deception…..but does it really mean that? I just woke up from a dream where one button head shark (that is the name I called it in the dream) and I was kicking it away from me and a boy in shallow sand/water. As we are sitting at sea level we try to get back on the land that is 7 feet taller. We are helped by a native boy who barely speaks English. Once on land we start to walk back to the city/town and look back to see a dead tree trunk get erroded away and fall into the ocean swallowing up the boy and the shark eats/kills him. … Then my second dream was in a city and had no sharks associated with it. Then my third dream was sitting on a dock and having g a very large aggressive shark bump the dock legs that creates me and the boy to run to more stable ground. But to do so we have to go over open water and areas of open sands about 5-6 feet wide and the length of my vision. As we run back the shark is trying to get us by jumping the sand dunes , flipping over and doing anything it can to get us. t one point in time we are walking on the belly to help spend less time in open water. We made it. I have anywhere from 1 to 8 dreams every night. Many of them exist is a certain order that I can track because I remember them all and write them down with as much detail as possible. But any more, since I have been doing this for 2 years all I need to do is write down a couple key sentances then the whole dream floods back I to my memory. I probably have dreams about sharks at least 3-4 nights out of the week and very similar to yours that I would be swimming away from them to get to land and where the shore line is the sand is taller than me and you need help to get up.. Most of the time people are just staring at me but I always somehow manage to get up it and then a tidal wave will somehow seem to appear and I’m basically running for my life seeing the Sharks in these tidal waves coming for it but I’ll make it to higher ground in time but will see the Sharks swimming around the house I made it into.. Especially being so close to getting eaten! Hi Selena, Had the weirdest dream two nights ago. I was a shark running out of water. I jumped into a water park and navigated the slides trying to find my way to the ocean. Finally I found it. I jumped from my slide only to be trapped in a walled off part of the ocean, my husband, also a shark was trapped on the other side with very little water. I used my tail to splash water onto him. LOL Want to have a go at the interpretation. It was so super odd. I never dream of sharks. Last night I dreamed that I am in the ocean with a friend and its dark . I don’t want to move in tbe water because I am afraid that I will attract the sharks. Suddenly I see Fisher men trying to catch a big shark and I looked over and saw hundreds of sharks in that area. I was surrounded by sharkes. I saw the shore and swam there as fast as I could then I woke up. HELP. I had a dream that I was at a swimming pool and there was what I thought was a small whale. I went to see it and the thing flipped around and it was a SHARK. It bit my finger and I woke up? WHAT DOES IT MEAN? Shark dreams have always meant trouble for me. I’m not necessarily a dream expert, but I can draw on what I’ve read and dreams I’ve had. Water is usually indicative of change, so I’m assuming if you’re swimming in a pool, it’s just your subconscious calculating the changes in your life. Seeing what you assume is a whale, only to have it be a shark when you turn around, could mean that there’s something in your life involved with the change. It looks like one thing (and not a threat) but it’s something you need to be careful of. Sharks are predatory creatures. Because of the context of this dream and the bite, I would ventures to say that it might be a symbol for someone you know (or a particular situation) within that change that has malice intent and isn’t quite what it seems. Hi Selena, I was wondering does it mean anything if you die in your dream. Or if you interrupt you die in your dream? I was bitten by a shark on the side of my face. I remember remaining very calm. But I also remember the feeling of pain and the teeth going into the side of my face and the ringing in my ears then complete blackness. Then I woke up. Is this just a regular shark attack? Or does this have a deeper meaning? t i dreamt last night that i jumped into the ocean and i sensed danger for some reason something told me told me not to jump in but i ended up falling in and i was scared because the water was pitch black and as im in the water i try to swim up to get out and catch my breath but its like the more i swam up the deeper i was then it happened. a bull shark attacked me then another different type of shark came close to my face the bull shark bit me gently and started to drag me into the water then someone rescued me and pulled me out. when i was pulled out of the water by some man i wasn’t harmed but i was still scared and relieved. I had a dream I jumped in water and on my way down I saw three sharks swimming in a circle, they saw me but never gave chase they kept swimming and let me get to the other side. What does this mean? Hi there. Thanks for your very descriptive and intuitive piece on sharks and dreams. It would seem that the general thread here is that people are dreaming of sharks chasing them. I had a dream last night where the shark was at the bottom of a huge waterfall, and I watched a lady fall naked into the mouth of this shark. This lady had just finished doing something miraculous for a group of people (don’t recall the exact details, but I think she was a doctor or healer or something). As she fell backwards, she had her arms wrapped up under her legs, her knees tightly into her chest, and was smiling up at us. There was another lady in the water, who was trying to warn her of the danger. When she landed into the awaiting open jaws of the shark (yes. it was reminiscent of jaws), you could see the pain in her eyes as the shark bit down. The lady beside the shark began to pry open the jaws, to set her free. The good news is that the lady was freed, and somehow miraculously saved. The dream then flashed forward to the past, where I was the one who held this lady in my hands. Only, we were no where near this said falls. I was walking up a hill. She turned into the size of a doll suddenly, and was wrapped in the cloths I had wrapped her securely inside. I had only so much time to get her to the hospital and save her life. And yet, I knew she was going to live because I had come from the future. What was going through my mind at the time was: Maybe I was the lady in the awaiting waters who saved her. What was most concerning though, was trying to convince the doctors at the hospital that I was from the future and that this lady would somehow survive. Hence, I was wasting precious time trying to get to emergency, because I was flooded with too many thoughts of “what if’s”…. Hope your day has been well. I’m hoping to get your input of my dream last night. I was on a boat by myself and the boat kept flipping and swerving sharply forward and backward and I was holding onto the railing of the boat and never fell off, at one point there were baby sharks and with one shark my hand was in their mouth and I felt how sharp their teeth were but I was about to get my hand out of his mouth before he could do a full bite. Do you have any input? My name is candy and had a dream that I was walking around and all of the sudden I fell into a tank of water and it was only me…and then a shark came swimming up to me and then we made eye to eye contact and I just knew the shark was going to eat me so I started swimming backwards and then the shark started to open its mouth so I closed my eyes and waited and nothing…? So I opened my eyes and saw another shark swimming up to me and then one bit my shoulder and the other bit my leg and I started fighting them and some how I got lose from them and they started fighting and I started sinking to the bottom and as I was sinking I was trying to get the courage to swim past them I wasn’t wounded at all…so as I started swimming and all of the sudden I saw a huge shadow so I looked way up and I saw a great big whale going straight a cross but all I seen was the black and white part of its stomach and so I looked at the two sharks and they where looking at the whale and then they looked back at me and then swam away and I swam to the top of the tank and climed out…and I started running to get back home and then all these people started go down to the tank and I yelled no! And then I woke up,is there any way you could tell me what this dream means?is the dream trying to tell me something? Selena? I made an account but it never ask for a password and ikd what to do? The account won’t do anything – I actually haven’t tested out that functionality. Don’t worry about it! Thank you Selena ,I kind of forgotten about the dream I had of the two sharks and the whale until I received an email from you,all I know is when I woke up from that dream it felt so real and I was still scared through out the day and I’ve not had anymore dreams like that one.I was doing some research and I saw you and I read about your dreams and I thought maybe you could help me understand why I dreamed of this… You never replied back to me about it ,I guess I was going through something and my dream was trying to warn me? I too am a vivid dreamer every night. My story is a little different because I started having seizures that were stress induced. Before the seizures started though, I started dreaming about sharks…eventually it turned into every night about being eaten alive by sharks. Even if my dream started benignly, the plot would eventually turn into sharks, then eventually I started having the seizures. I eventually had to seek help with a therapist. I learned about dream shadow archetypes and that the shark was a manifestation of my own subconscious and feelings I had shoved down and buried. After 8 weeks of therapy, I continued to dream of sharks but I was swimming peacefully along with them, not a victim of them. I went three years without a seizure and last night I dreamt a great white in complete armour was chasing me but I continually evaded it. So, I thought it was a one time fix the problem and in the past….obviously I need to not neglect my sharks when it seems to be over. I need to continue to acknowledge them and work on healing….that way it doesn’t build the stress back up to seizures. So tonight I watched Babadook the movie. Watch it. And realize we all have Babadooks. We can’t get rid of these shadows but we can tame them. My Babadook just looks like a shark. I feel like my dreams can be best described by telling the old folktale about the battle between the good shadow and the bad shadow of my soul. Which one wins the battle? The one you feed the most. Hey Suzy! I plan on replying to this in more detail, but I just wanted to say that you found the way to my heart with that movie recommendation. When your comment came through, I went to find it on Netflix and watched it. Absolutely LOVED it. I read a lot of discussions about the movie afterwards – I won’t get into them here, but there were so many underlying meanings that can definitely be tied back to the idea of the shadow archetype. Thank you SO much for the recommendation!! Hi Selena. I had a shark dream the past couple of nights, however, last night was strange. Me and three of my close friends were having a good time on a beach. We were singing, laughing, and having no care in the world. Two of my friends swam out into the sea but I stayed behind and watched them, because I was afraid of the sharks. Go figure. To make a long story short my cousin/good friend was getting attacked by one and i ran and saved her. After that its a little blurry. What do you think that could mean? I had a shark dream today early morning. We were at sea in a small boat and my brother was alone on a smaller boat on which he was standing. We (me and family) kept telling him to jump over as we’re going deeper but he wouldn’t listen and say don’t worry he’s fine. Soon we saw lots of sharks in the sea coming towards us. I kept screaming at my brother to jump to our boat but he said no the waters are getting shallow the sharks wouldn’t come this side. Suddenly with a wake my brother tripped and he lost his boat. He was in a the water but standing half way. We were in shallow waters. However after few minutes a shark bit his leg. Please advise what do you think should this mean? I’m very very scared. I dreamt of swimming with sharks in the ocean. I usually remember crazy dreams, but it’s funny that I never dreamt of sharks before–they did not bite me actually liked me to scratch their back. during this time I am having relationship troubles with my oldest child; she does not want to talk to me. Ok. So I had a dream. My kids and I were on a deck by the ocean. I was talking yo my older son and laughing . He jumped in water onto a killer whales back and rode it to the shore on the opposite side. then my younger son jumped in and I told him no as he jumped in a shark came up and ate him. I jumped in the water and could not find him or shark. I could not dive deep because I can’t swim. I ended up in a home going thru my youngest son things crying and screaming. This morning, my 7-year-old daughter woke me up saying she had dreamt about me being friends with a shark. I opened my mail box to find a threatening letter from a loan shark (in this case, my insurance company’s fault). Coincidence? Maybe — if this kind of thing didn’t happen very often; but it seems to be happening to me more and more — or, at least, I seem to be noticing these things at an ever-increasing frequency. I keep a ‘synchronicity’ (Carl Jung) journal — a record of lots of interesting ‘coincidences’ like this which, on reading through it, shows how interconnected things are. Obviously, one event affects and another, and so on, and so on, in a very complex way, but I wonder if, as with my daughter’s experience above, we can tune in to it, picking up on the ‘energy’ just before it reaches us? (I’ve certainly never mentioned the term ‘loan shark’ to my daughter.) Regardless, and quite separately, at the risk of sounding cliched, what can be extrapolated from all of this is that our life experience is almost entirely subjective — you choose what to focus on, and depending on what you focus on, your life experience changes — and in this way we quite literally create our own reality. Does the shark shrinking in size make any of the meaning’s different? In my dream it was a gigantic and very fast bull shark it was chasing my family member (well several were in the water it was only my older sister who left a day ago). Once the shark stopped chasing my sister and came towards me I had found myself on a rock in the middle of the water, the beach not too far away and the shark had turned into a small bull shark, a little larger then a grown mans arm. I dove into the water swimming for the shore, although i didn’t see the shark or feel it I don’t know what happened because the dream woke me up before i made it to shore. Hi. I dreamt last night that I was at a beach and someone said not to go near the water ’cause there’s a shark in the shallow water. I don’t remember actually seeing the shark, but imagined it was huge and probably took up quite a bit of space then walked away. What do you think this means? hi selena i just want to know what is the meaning of my dream. and the dream was like dthis. i was in house and the house was like in the ocean and then i was with daughter and son ( but i don’t have those in my real life now ) and then my daughter in my dream was screaming and she said the ocean was turning into red. and then me and my son see what’s happening and we shock that there are so many sharks. but the sharks attacking the sharks too that’s why the reason why the ocean become to red. i don’t really get then message or the meaning of my dream i hope you can help me find out what this dream mean to me. I had a nightmare of sharks that I have had several times. I am swimming in a warm beautiful Aqua blue clear ocean, all of a sudden the water turns dark and cold, there are more sharks then I can count swimming around me. Faster amd faster they circle until one grabs one of my legs and pulls me down. As this happens, the other sharks swim at a fast pace around us, other sharks then swim in and start to tear bits off of me, until I am a torso and head. I look upwards and see a large great white swimming towrds me, I scream as its mouth opens and I awaken just before its jaws clamp onto my head/neck. i had a dream about a shark trying to look for me but as soon as he found me he would stare at me and slowly swim to the other side . its like if he knew i was there but for some reason he would pretend like if he didn’t notice me . as soon as i got a chance i got on top of this big rock and he saw me do it and he didn’t do nothing in order to stop me from escaping . as soon as i got to the rock he got to edge of the rock and started talking to me saying wow you are different you are not scared of me that is why i let you escape i didn’t feel you frighten of me . The thing is that sharks have a misinterpreted meaning by humans. They actually eat the diseased fish of the sea, cleaning up the oceans as they go and not the vicious meaning portrayed in the media. Perhaps not such a bad thing to have in a dream after all.